Pensacola makes Strong Towns final round, a generous donation and more! We breezed through round one against Manhattan, Kansas, fought hard in round two against Delray Beach, Florida, sailed through the semifinal against Guthrie, Oklahoma and now we are here—the final round against Portsmouth, New Hampshire. Let's bring this championship home! Vote now for Pensacola in the Strongest Towns Competition. People have been casting their votes for the cities that are doing the most to demonstrate their commitment and concrete steps toward to a financially strong and resilient future. Strong Towns is an international movement dedicated to making communities across the United States and Canada financially strong together. Be sure to vote for Pensacola by 12 p.m. today, Thursday, April 11. Leaders from City of Pensacola, Escambia County, National Park Service and Pensacola Bay Cruises will come together April 13 to cut the ribbon and celebrate the grand opening of the new Pensacola Ferry Landing. Port Director Amy Miller, Councilwoman Ann Hill, Mayor Grover Robinson, Escambia County Commissioner Robert Bender, National Park Service Superintendent Dan Brown and Pensacola Bay Cruises General Manager Joe Asebedo will speak at the event which begins at 10 a.m. The public and media are encouraged to attend. Refreshments and tours of the facility and boats will be provided following the ceremony. Located at the head of Commendencia Slip between the Port of Pensacola and Plaza de Luna/Palafox Pier, the new $3.5 million dock and terminal building will serve as the homeport location for two vessels; the “Turtle Runner” and “Pelican Perch” are the National Park Service's 150-passenger, catamaran-style boats. 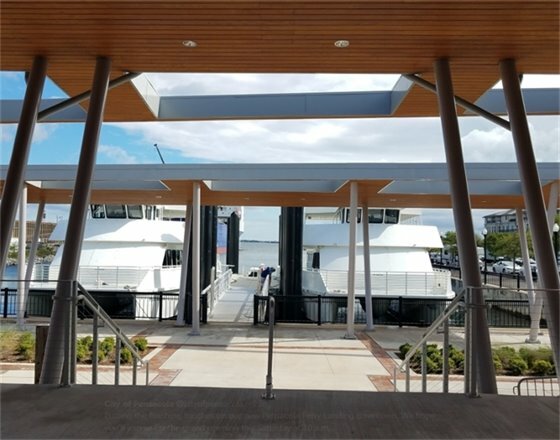 The grand opening of the new landing comes in anticipation of Pensacola Bay Cruises beginning service for the recreational season. HMS Ferries, Inc. is the concessioner under contract with the National Park Service to operate the boats. Once in service, the boats will transport passengers between Quietwater Beach, Fort Pickens and downtown Pensacola. The Downtown Ferry Landing project was funded through grants and the City's Community Redevelopment Agency. Grant awards came from the Office of Federal Lands Highway's Federal Lands Access Program (FLAP) and the Florida Seaport Transportation Economic Development Fund. The dock was constructed by Bellingham Marine Contractors based in Jacksonville, Florida. Green-Simmons Company of Pensacola won the contract to build the terminal building. 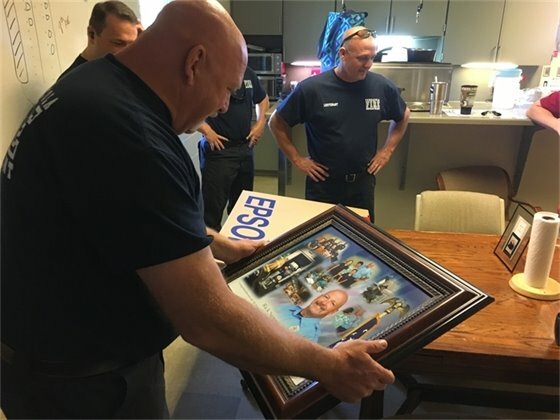 Captain Rick Simmons retires from Pensacola Fire Dept. The City of Pensacola just received a generous donation from RBI Pensacola for their t-ball program held at Fricker, Cobb and Woodland Heights Resource Centers. RBI has given the City a monetary donation of $750 towards the purchase of t-ball uniforms as well as donated and loaned equipment for each of the teams. Reviving Baseball in Inner Cities (RBI) is a Major League Baseball youth outreach program designed to increase participation in baseball and softball among underserved youth and promote greater inclusion of youth with diverse backgrounds into the mainstream of the game. The hats, gloves and uniforms will be distributed to the players to keep. Coaches will receive hats to keep as well. The remaining equipment is on loan from RBI for the season. This is the second year that RBI Pensacola and the City of Pensacola Parks and Recreation have partnered to provide inner city baseball and t-ball programs. The league begins their regular season play on April 27 at Fricker Resource Center. Students from the University of West Florida took first place in the MuniMod competition in Orlando this past weekend. The team won with their vehicle telematics product, a vehicle plug-in device that would transmit data about driving activity. The product, “USafe Technologies – Vehicle Telematics IoT,” would enable local governments to increase accountability, fiscal responsibility and transparency in their municipal fleet vehicle maintenance. Florida A&M University took second place in the competition. Hosted by the Florida League of Cities, MuniMod is the only civic tech competition in Florida to focus solely on solutions for cities. The weekend event brought together six teams from universities across Florida to showcase student-developed technological solutions to common problems affecting communities. Students, ranging from freshmen to PhD candidates, tackled challenging areas such as sustainability, emergency response communications, property redevelopment and permitting processes. 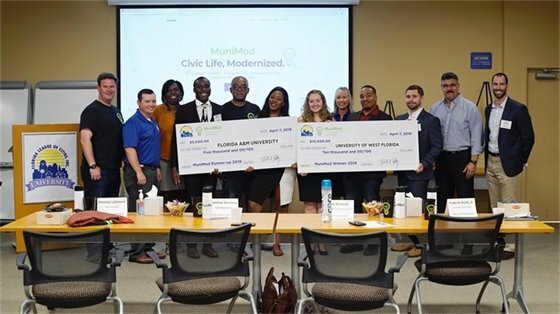 In addition to receiving marketing advice and access to numerous networks across the state, the winning team from the University of West Florida took home a $10,000 prize. Florida A&M University took home a second-place prize of $5,000. MuniMod lays the foundation for a new generation of civic problem solvers by giving students a way to apply their skills to real-world issues. By working to bridge the gap between technology and cities, the students will help cities throughout Florida and potentially nationwide. You can read the full news release on the Florida League of Cities' website. Load on up and take a trip to the Hard Rock Casino with Bayview @Brownsville Seniors crew to Biloxi on April 24, 2019. The bus will take passengers at Brownsville Community Center and depart no later than 8:30 a.m. The cost for the trip is $10 per person. 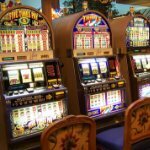 Seniors will receive $20 in free play and half off their buffet. Ages 50-up, please. If interested, sign up in the Brownsville lobby or contact Jeremy Street, Recreation Supervisor, directly at (850) 912-4104. Have your Easter baskets in hand, as an Easter Egg Hunt will be underway on April 20, 2019 from 10 a.m. to 1 p.m. Egg Hunt times will vary by age group. The event will be hosted by Fricker Resource Center and Sonshine, with Magic 106.1. Admission is FREE, all that is required is your will to hunt! Join Home Care Solutions for a Senior Game Day Expo on Friday, April 26 at Brownsville Community Center from 9 a.m. to 12 p.m. for games, prizes, and door prizes all morning! Over 20 local vendors with valuable info for attendees! Finger foods provided by Longhorn Steakhouse. 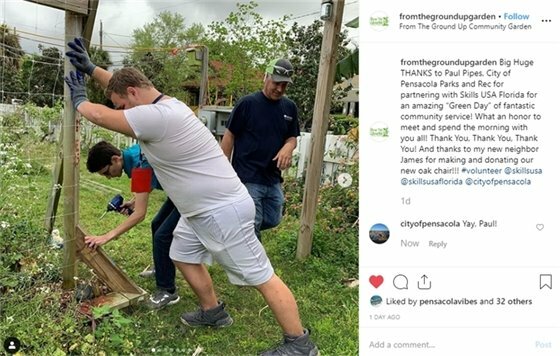 Be sure to tag us using @cityofpensacola so we see your pic!